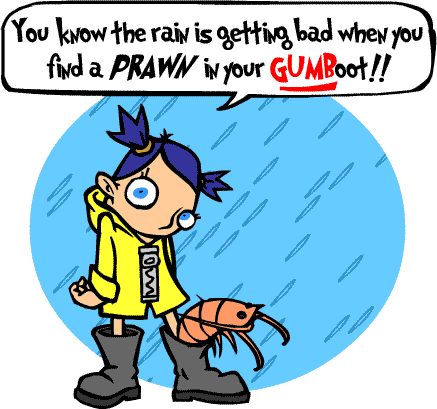 a girl with a prawn in her Wellington GUMBoot! Vocabulary is the building-block of any language. Language learning is fun, quick and recall is more effective with the innovative, multi-faceted 200 Words a Day! language-learning systems. Learn languages with 200 Words a Day! Build up your vocab quickly and effectively. Unique Memory Triggers and cartoons help you learn and remember each and every word like the one above. Built-in Gender triggers help remind you of the gender of nouns. Save time by learning these at the same time as the word. Over 1,000 common words per course in presented in our innovative, interactive software. Designed for PCs (Works on Macs with pre-installed PC Emulator software). Customise the programme to suit your learning preferences. Learning schedule organises and tracks your progress. Sentences: every word is linked to a practical sentence, written and recorded by native speakers. Click on the picture to view the sentence before moving on to next word. Great for extension practice. The sentences also feature as an independent course with learning schedule and testing features. Select this option for variety or as a learning alternative. Based on traditional flashcard methodology, only interactive. Great photographic visuals. Ideal for testing and great to consolidate your learning. Our first Grammar course incorporating lots of accelerated learning techniques, cartoons and memory triggers to make grammar learning so much easier. All aspects of Basic and Intermediate Italian grammar covered. Every word is presented with an imaginative, often quirky Memory Trigger and cartoon. Creating a link between the English word and the Foreign word, these mind pictures help you to remember words easier and recall them more effectively. View each foreign word with its own memory trigger and cartoon, including animations like the one above. Hear each word pronounced by native speakers. Customize your learning to suit your style. Learn at your own pace with personalised learning and revision schedules. Databases for up to 6 students. Available on CD or by download. e-Flashcardz - alternative Flashcards learning and testing option for every word with great photographic visuals. Sentences Course - see, hear and learn a sentence for every word, perfect for extension learning and practice. Remember the picture ... recall the word. Enjoy your language learning. It's that simple. Fun and easy to use with a host of unique features for language learning the way you want to learn languages. You can easily learn 200 words a day (or more!) easily, it is achievable with minimal effort. Follow your language learning progress and achievements with comprehensive Progress records. Accelerate your language learning now. This software is designed for PCs. For Apple Macintosh users, please ensure you have Windows Emulator software pre-installed on your Mac. We recommend VM Fusion. Keeps you updated with changes to the 200 Words a Day website, on excelerated language learning. Check out the Memory Masters' techniques. Lots of tips and tricks on accelerated language learning. Speed up learning Spanish vocab using proven Memory Master techniques. Words effortlessly snap-lock in long term memory for easy recall. Are you learning 200 words a day? Learn French with 200 Words a Day! Memory techniques now with e-flashcardz. Interactive, innovative, easy, effective. Learn German 200 Words a Day. Yes, YOU can. Modern Memory techniques, with cutting edge, easy software make excelerated language learning so much more effective than traditional learning methods. Learn Italian the 200 Words a Day way! Learn Welsh the easy way. World's Memory Masters make language learning faster & more effective than ever. Memory triggers make it easy to remember words & concepts, using loads of cartoons! I have something you want! Spanish verbs are tricky. But they follow patterns. With Memory Masters' fun methods you learn Spanish Verbs patterns easy. Concepts stick. Patterns imbed in your mind. Order Page for 200 Words a Day! Learn Spanish, French, German, Italian and Welsh courses. Download or CD for PCs. Your documents and recordings translated fast and accurately. Spanish, French, German, Welsh translation, by language professionals. Exceltra Translation Service, serving the UK and world. 200 Words a Day! language learning products will teach you vocabulary rapidly, and efficiently. What's more - you'll have the tools to help you remember what you have learned. Verbs, nouns, genders. 200 Words a Day language learning courses - Spanish, French, German. Not learning at this rate? You're out of date. Here's how it is done. Language learning the easy way! Learn memory masters secrets. 200 Words a Day! Site Licence available for Schools and Organisations - three versions including Managed Learning Environment. Technical help for your 200 Words a Day! language learning software. Accelerated learning of languages! Learn French, Spanish, German, Welsh, Italian and more. 200 Words a Day! language learning software. Read what customers have to say in their Testimonial. Learn languages the 200 Words a Day way . . . about us . . . Many Frequently Asked Language Learning Questions are answered here, with particular regards to the 200 Words a Day! vocabulary building programmes - Contact us with your questions. Effortlessly snaplock words to memory.Language Tutorial -200 Words a Day accelerated language learning courses.Super Learn French, Spanish, German, Welsh language -accelerated superlearning made easy. Our French Word of the Day brings a new picture each day, using the Memory Trigger cartoons of the accelerated learning 200 Words a Day French learning system. You can even add it to your own website. Your Daily French Lesson and Verb of the Day - fully conjugated. Every day a new French lesson appears on this Daily French Lesson page. Word of the Day, verbs fun facts on French language, culture, people, important days in France. Add it free to your website. Keep up to date with our free 200 Words a Day language learning ezine. A Free Spanish CD-Rom from 200 Words a Day. Every month. Choose French-Spanish or German. Free to enter, & you'll learn the Secrets of the World's Memory Masters & these help learn a language. Check out the Spanish word of the day with a pic. Link to Us for your Word of the Week, Language Learning Tips. Your tips for learning Spanish, learning French, learning German. Get free material for your website. Learn your free Spanish proverb of the day! A bit of Hispanic wisdom as you learn Spanish and improve your Spanish speaking. Check out the Daily Spanish proverb a Day helping you to learn Spanish. See the German proverb of the day. You can add this to your own website by copying the free code on this page. A new proverb will appear every day of the month. Discover our Free Spanish Travel Word of the day ! Discover our Free word of the day in French to add to your website! Beware - a French decade is much shorter than an English one! Find out how this can be so. Also check out the daily French verb in today's Learn French blog. Improve your French with these French Rugby terms and phrases. These are quotes from French TV commentary of various French International matches. You'll love the Fiesta de San Fermin, or Festival of San Fermin. An annual spectacle in Pamplona, Spain, with the Running of the Bulls, bullfighting and the Running of the Nudes! Select a free Spanish lesson from the man here. Emailed direct to your e-dorrstep regularly we have byte-size courses on many a learn Spanish topic sent every 3 days to you. As many as you want free. Contact Us at 200 Words a Day. Help us with our 200 Words a Day! language learning survey and we'll send you a free language learning video, and reports. Spanish Vocab Turbobooster software teaches 30+ families of words. Just change a few letters from English. Remember genders. Incorporates Memory Masters techniques from the 200 Words a Day! team. "Ser un cuero" in some parts of Latin America means to be a stunner. But in Puerto Rico it means "whore"! Oh dear ... Check out our latest learn Spanish blog entries, and send us your own too. Spanish Proverb learning is a great way for a beginner & intermediate Spanish language learner to boost their language skills. Proverbs and idioms are part of real every day speech. Learn to conjugated the verb for to sleep in Spanish, including sample sentences. Learning the Spanish for stop is easy when you use a Memory Trigger. the 200 Words a Day! system makes it easy remembering vast numbers of words quickly and efficiently. Meanings and uses of the Spanish Verb bajar - to go down, to lower, to get off, to download. 200 Words a Day! Spanish Memory Trigger cartoons make Spanish vocab learning much more effective. Upload your OWN & check out others' contributions. Deep memory embedding leads to ace memory recall. Do you want to learn Spanish like crazy? Try out the crazy, zany, ridiculous methods of the 200 Words a Day! team whose Spanish learning techniques are the most effective and speedy on the market. What is French for sausage? do you mean the hot one or the cold one? Your French Pronunciation Guide - free download to try - hear the sounds of vowels and consonants and their various combinations. The French for fill (the verb - to fill) is combler. How to NEVER forget this! The 'Learn French Blog Archive' contains previously featured blogs for French learners, taken from the 200 Words a Day! accelerated language learning website. Blogs to August 2007. French in Action is a free French course. This resource whose 52 Videos on Demand use immersion techniques (no translation). A perfect complement to your 200 Words a Day French course. Get your free weekly French Newsletter emailed to you. Lots of lessons, verb tables, sentences, fun facts are handy things to know about French language. To help you remember which words are similar in French and English we provide a cartoon with a scene in the French colours. See the cartoon. These make it easier to remember and recall new words. Copy and paste this daily French lesson code to your website and a new lesson will appear on your own website every day of the year. 365 days a year. These are lessons and verbs fully conjugated. Here are the instructions for your FREE FSI FRENCH COURSE by email. 1,000 pages of lessons, 20 hours of audio recordings (mp3) that you can listen to in your car, iPod, PC. 24 Units come in 2 volumes. Learn how to say the colours in French with this free lesson. Masculine and feminine forms of the main colors. You call me Goethe - I'll call you Schiller - a saying. German snippets from 200 Words a Day! Learn German Blog. Interesting little bits and pieces of German language, culture, customs. 200 Words a Day! Learn German Course 2 now here for Windows PC. Mac users need Virtual PC. Another CD course with 1,000 words, phrases, cartoons, word association memory triggers for super recall. The German for railway track is das Gleis. Never forget it! 200 Words a Day! The German for railway track is das Gleis. To always remember this you are best to have a Memory Trigger, a cartoon so you'll never forget. The 200 Words a Day! system does this for you. Is typing German for typical? COMING SOON! Get free German lessons from the Foreign Service Institute by email here soon. Learn and remember the word in German for sender use visual learning techniques to build up your German vocab. Check out the language learning book review pages. 'The Third Ear' - You Can Learn Any Language' by Chris Lonsdale is today's. Get our unbiased views and reviews of books on language learning. The masculine gender is one of three genders of nouns in German - masculine, feminine and neuter. Chinese Memory Triggers. Excelerated language learning tricks - check them out! Chinese Memory Triggers are the key to excelerated Chinese language learning. Check out these ones for remembering Chinese. Take is dai chu - so take this DIE and CHEW it! Simple. 200 Words a Day! 200 Words a Day! Welsh Memory Trigger cartoons make learning Welsh vocabulary easy. Upload your OWN see those of other visitors. Deep embedding in your memory means stronger memory recall when needed. There are only 2 characters that cause a bit of trouble for someone typing Welsh characters on a Windows PC. The w and y with a caret over the top, are not standard ASCII characters. Language learning flashcards are an effective way of learning foreign language vocabulary.The 200 Words a Day! system is a flashcard software system using Cartoon Memory Triggers making recall easy. All about Verb Tenses - their names, moods and how to remember them. Total immersion Language Learning - a must for Consolidation and Fluency. Total immersion in language learning is where the learner spends time in an environment operating solely in the target language, and is completely surrounded by the language. Best tool for fluency. Simulated Immersion in Language Learning - FAKE it til you MAKE IT! The best way to become fluent in a language is to live where it is spoken. But many people do achieve a high level of fluency without this. HOW? What is the key common factor? Here's a powerful tool! e-Flashcardz are German flashcards presented in a software program for speedy language learning. A stand-alone product that can be used to phenomenal effect with the 200 Words a Day Memory Triggers! e-Flashcardz are French flashcards presented in a software program for speedy language learning. A stand-alone product that can be used to phenomenal effect with the 200 Words a Day Memory Triggers! Going away on vacation? Need some Spanish holiday phrases,or French, German, Italian, Welsh holiday phrases. Check out 200 Words a Day courses now - all have sections on useful vacation phrases. Learning foreign languages +vocabulary is super easy if you (1) take the lessons of the Memory Masters (2) combine them with powerful multi-media technology (3) add the latest educational techniques. Dr Pimsleur developed language courses which are based on conversation and that teach the student using audio only, with phrases, sayings and sentences taught in the context of conversations. Free software trial for schools. A difficulty of teaching Modern Foreign Languages in Schools is the teaching of vocabulary in such a way as to gets students to remember the words, and their genders. Existing users can get a free language course upgrade, which adds new features to your 200 Words a Day language learning software. Check out the new additions, improvements and download free. Here is your free download of 200 Words a Day! software version 5.25 which will upgrade software that was bought before 1 May 2008. Lots of nice improvements mostly from users' feedback and input. Electronic flashcard instructions. How to use e-Flashcardz using photo flaschards to help you learn French, Spanish, German, Welsh vocabulary. Inbuilt testing and recording or your scores. e-Flashcardz are Italian flashcards presented in a software program for speedy language learning. A stand-alone product that can be used to phenomenal effect with the 200 Words a Day Memory Triggers! Travelling on the Eurostar is much better than on aircraft for short distances around Europe. Check out some travel words in French, Spanish and German from the 200 Words A Day! team. I am struggling to make Sentences ... what should I do? French for topple is the regular ER verb 'déboulonner.' Imagine you TOPPLE DE BULL ON A statue. All the tenses and conjugations in a color-coded verb table. French for counteract, foil, cross is the verb 'contrecarrer'. Imagine officials COUNTERACT and FOIL the plans of the rebels in the COUNTRY CAR. All tenses, past, present, future, conditional etc. Daily verb lessons of French and Spanish verbs appear here ever day. French Bescherelle - Every Student of French Language Should Have One! French Bescherelle is a must-have book for any student of the French language. It covers the 82 patterns of verb conjugation of the 3 different types of verbs - ER, IR and RE. 89% of verbs are ER! The Spanish Bescherelle is a must-have tool for every student of the Spanish language. This review covers its contents and some of its weaknesses, and why it is not as good as the French Bescherelle! Learn 200 Words a Day! Italian with new breakthrough learning techniques. Discover how to harness the skills of the Memory Masters. Get your free 'Learn Italian Newsletter Confirmation' here. New!! Your Daily Italian Lesson. A new fully conjugated Italian verb every day with a cartoon memory trigger. 3 minutes Verb of the Day from its colour-coded verb table. Learn ALL the tenses. Fast..
French Tips and Tricks - learning with 200 Words a Day! Subscribe to 200 Words a Day! French Tips and Tricks emails, find out how to learn and remember French words quickly and effectively, and all about the many customisiable features of the course. Learn Spanish in Caceres - there are lots of good reasons. Most importantly it is pure Spanish in a 'pure' part of Spain, less touristy, not inundated with sun-reddened lager louts. Just pure Spanish! Learn some of the many French idioms using air. Like 'il parle en air' - he talks a lot of hot air. 'Nous vivions de l'air du temps' ... we lived on air alone ... and more useful idioms like these. Thank you for confirming you would like to receive the 200 Words a Day! Tips and Tricks email series. Learn to customise your learning using all the features within the programme. All Spanish learners must know the ten most important Spanish verbs. Link to their verb tables and learn all the conjugations in all the tenses. 3 minutes a day for a month brings astounding results! Learn and remember the word in Spanish for snow with Memory Triggers - a fun, effective way to learn from 200 Words a Day! The Daily Spanish Lesson features a new fully conjugated Spanish verb every day with a cartoon memory trigger. 3 minutes Verb of the Day from its colour-coded verb table. Learn ALL the tenses. Fast.. This SPANISH LESSON LIST groups verbs by their family of endings. Spanish verb conjugations - conquer them! View the Italian Lesson List of daily verbs fully conjugated. Learn by Tense and by Subject. French verb ALLER is a top ten French verb. Learn ALL the tenses here in ONE SHOT using the colour-coded verb tables. Aller can be used as an easy way to express the future tense. 3 reasons you MUST learn ALL the tenses of the French verb AVOIR (to have) BEFORE ANY other verb. 1. Its SIMPLE Tenses are used AGAIN and AGAIN to make the compound tenses for MOST other verbs. The word for make or do in French is the French verb FAIRE. The best way to learn ALL the conjugations is with out colour-coded verb table. This way you can even learn the so-called 'hard' tenses too. French verb POUVOIR means to be able to. 7 important things you need to know about POUVOIR. This is a MODAL verb, and you can just add an infinitive to the end to make thousands of useful phrases. Learn the French verb VOULOIR, which means to want. Learn all the conjugations for all tenses fast using the colour-coded verb tables with our video being narrated by a native French speaker. French verb DEVOIR is one of the top ten French verbs. Learn all the tenses and conjugations with our video and our colour-coded verb tables. French verb DIRE. 5 Things to Know about DIRE. Fastest way to learn ALL the tenses is with these verb tables.